Since the University’s founding, the school’s three precepts of “Truthful”, “Useful”, and “Faithful” have been carried on without break in a liberal academic environment. 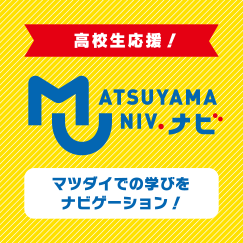 Matsuyama University is engaged in the development of extensive educational initiatives aimed at the creation of talented individuals who will be able to contribute to society. It does so by implementing a curriculum which is ahead of the times while also responding to the needs of the times, a curriculum which gives consideration to the cultivation of a comprehensive vision and in which students come in contact not only with specialized knowledge but also diverse ways of thinking through close communication with fellow students and teachers.